Summer time is beach time. 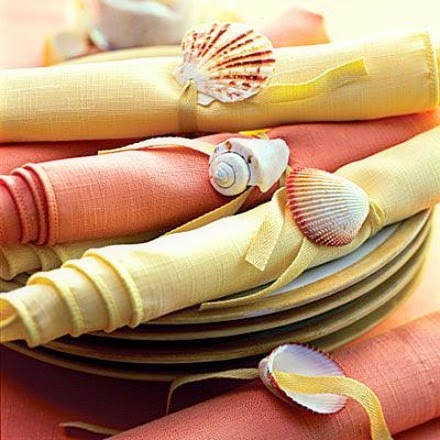 So here's a simple idea how to include the beach in your Table Setting with sea shell napkin rings from your Shell Collection. 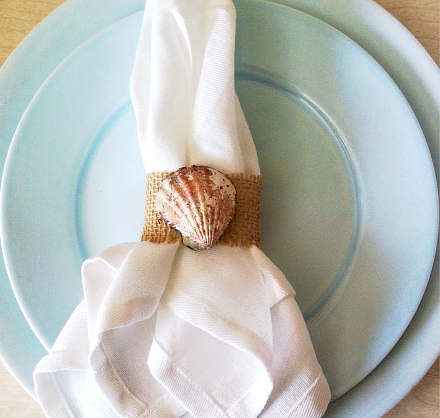 Sea shell napkin rings made with burlap ribbon by Danette Dillon. 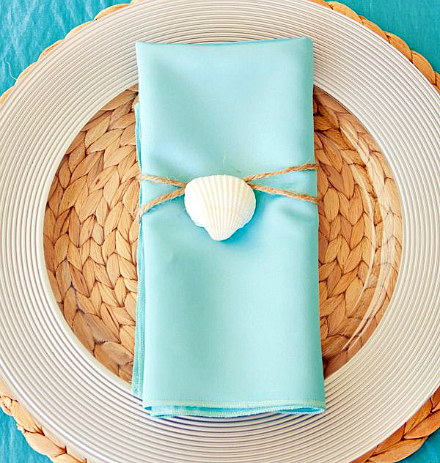 Blue napkins are bound with twine and a single sea shell for an Under the Sea Party. Holes are Drilled into Individual Shells that are then strung onto twill tape. Via All You. Or string each shell onto rope. Seen at Lonny. Add pearl beads for glam! By Creating Wonderful Spaces, featured here. 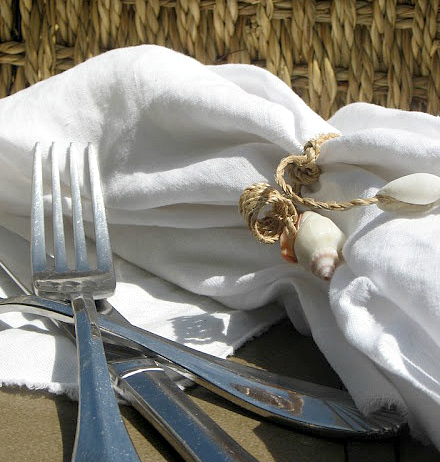 Or simply tie your napkins and glue shells at the end of the twine. Original source unknown. 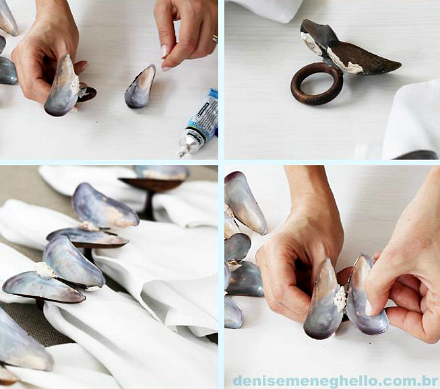 And this idea comes from Denise Meneghello via Facebook, gluing shells to simple napkin rings. 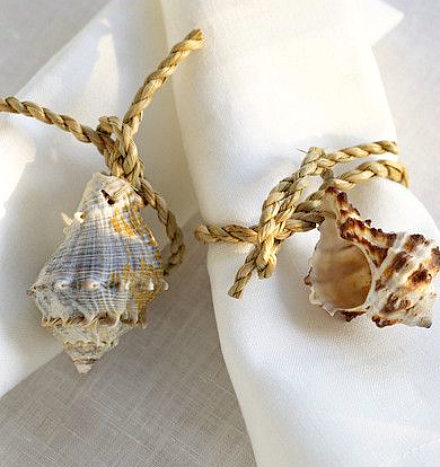 You might have napkin rings that you can decorate with shells. If not, get a bunch of Wood Curtain Rings for this project. 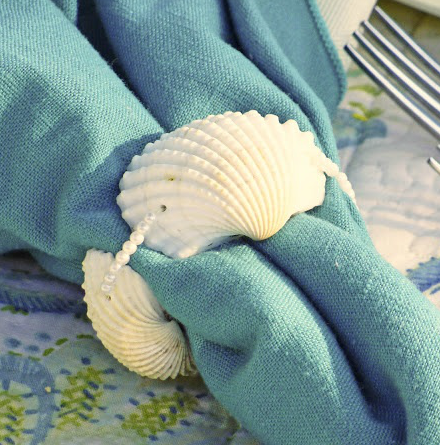 These sea shell napkin rings will bring the beach to your table in a simple and delightful way.